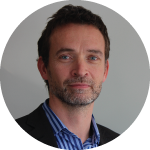 Guest blogger Dave O’Reardon returns today to explain ‘why you should tear up your support SLAs’. You can also check out Dave’s tips for the 2016 itSMF Industry Awards for Excellence in IT Service Management in last week’s blog post! Have you heard of the Watermelon Effect? It’s a rather common problem where Service Level Agreement reports for IT support show that everything is green but the customer is still unhappy. Green (statuses) on the outside, red (angry customer) on the inside. Research from Forrester shows how prevalent this mismatch of perceptions is – there are about twice as many IT teams that think they provide great IT support than there are businesses who feel they are getting it. One of the causes of this problem is that the metrics used in Service Level Agreements are a deeply flawed way of measuring service quality. They mislead IT support teams into thinking they understand how the customer feels about the service they provide. Typically, support service levels are measured on the basis of time – actual vs target time to respond, actual vs target time to resolve. But purely time-based measures are an ineffective indicator of the quality of IT support. Our customers’ experience of IT support is shaped by many things, not just how quickly we responded or resolved their issue. Factors such as how they were treated, whether they could understand what they were being told or asked to do, whether they felt well informed about what was going on and what would happen next (and when), and whether they were asked to confirm their issue was solved before the ticket was closed. Even something like time is not absolute. From personal experience, we all know there are many factors that can make the same absolute wait time feel longer or shorter. Ultimately, these experience factors are all about expectations and perceptions, not absolutes. The perceptions of those at the receiving end of the service – our customers. And the outcome of their judgement is their level of satisfaction. David Maister, a researcher on the psychology of waiting times, described this rather succinctly with the formula: S=P-E, where S stands for satisfaction, P for perception and E for expectation. As P and E are both psychological in nature, S can be attained when a customer’s perceived experience of a service, P, exceeds their expectations, E.
If you want to measure service quality (and you work in Service Management, so you should, right! ), the best way to do that is to ask your customers. 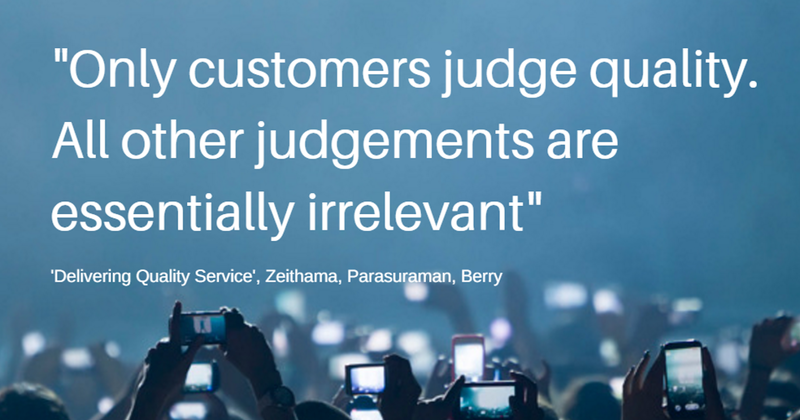 Valarie Zeithaml put this rather nicely in her book, Delivering Quality Service: “Only customers judge quality. All other judgments are essentially irrelevant”. 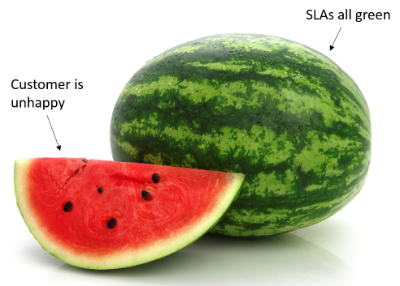 We need to stop putting so much focus on traditional SLA metrics and start focusing on customer satisfaction. The extent to which you can keep your customers happy determines whether your customer trusts you or bypasses you, forgives your mistakes or hauls you over the coals, increases your budgets or squeezes them, keeps you as their service provider or outsources you. And if you’re always asking your customers to not just rate your service, but to tell you what you need to do to improve (one of the principles behind the Net Promoter System), you’ll find this feedback to be a very powerful way to drive continual service improvement. By all means measure response and resolution times for your own purposes, but never wave a green service level performance report in front of a customer and tell them they should be happy. This post was based on an e-book, “Measuring the Quality of IT Support”, which can be downloaded here. Dave O’Reardon helps IT support teams adopt Net Promoter practices and use customer feedback to drive continual service improvement. He’s the founder and CEO of Silversix, the company behind www.cio-pulse.com, and winner of the Service Management ‘Innovation of the Year Award’ in 2015. Dave can be reached on Twitter via @silversix_dave or LinkedIn. For those of you not familiar with Net Promoter®, let’s start with a 1 minute introduction..
Net Promoter is an open-source methodology used by 65% of the world’s top 200 companies to grow their businesses by increasing customer loyalty. At its heart is a metric called the Net Promoter Scoresm (NPS®) that measures the willingness of customers to recommend a company’s products or services. An NPS is calculated by asking customers a question along the lines of, “On a scale of 0 to 10, how likely are you to recommend us to a friend or colleague?”. Based on their rating, a customer is categorised as a Detractor (when they give a rating of 6 or below), a Passive (7 or 8) or a Promoter (9 or 10). The NPS is then calculated by subtracting the percentage of Detractors from the percentage of Promoters. This results in a score ranging from -100 (all your customers think you’re rubbish) to +100 (all your customers think you’re the bee’s knees). Two very valuable follow-up questions ask the customer why they gave that rating, and what the number one thing is that they’d like to see improved. With me so far? Great. Net Promoter, as a system for driving service improvement, is often overlooked or rejected by IT teams because of the irrelevance of the “likely to recommend” question for an internal service provider. But that concern is easy to address by simply changing the wording of that question (a topic for another day!). With the question reworded, you’re free to enjoy the benefits that Net Promoter has to offer. 1. It is a globally proven service improvement methodology trusted by brands such as Apple, Google, Rackspace and Zappos. There are a mountain of case studies that show how effective it can be. Net Promoter has been around since 2006 and Google Trends shows that interest has been steadily growing ever since – it’s not going away anytime soon! If your organisation is already using Net Promoter, then using it for IT is a no-brainer. And if it’s not, then IT can lead the way. Your organisation probably won’t be far behind. 2. Unlike traditional surveys for gathering customer feedback, a Net Promoter survey – with only three questions – is ridiculously quick and easy for customers to complete. Not only that but the third question (“What is the number one thing we could do to improve?”) is like having a service management consultant working for you for free. Forget process maturity assessments! If you’re serious about improving service and delivering value, everything you need to know is contained in your customers’ answers to that one question. 3. The Net Promoter concept is simple to understand by staff at all levels. The survey is simple, the calculation is simple and the behavioural change it requires is simple – focus on reducing the number of detractors. And how do you do that? Just read the feedback given by your customers in answer to Questions 2 and 3 and all will be revealed. 4. 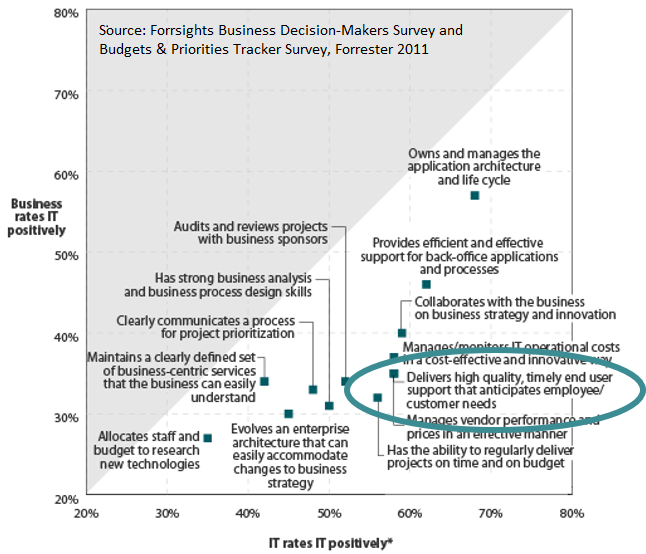 About 75% of IT teams do customer satisfaction surveys of one sort or another. They run the survey, calculate a metric and bury the results in a management report. But in all but a few cases, no improvement action is taken. This is where Net Promoter comes into its own. It includes some fantastic practices that help you turn customer feedback into prioritised actions that lead to improved customer satisfaction/loyalty. 5. When you use a standard question, rating scale and calculation method you can benchmark yourself against others using that same method. An NPS is standardised so you can compare your NPS to that of other IT teams. Hell, because brand and industry NPS scores are widely published, you can even compare yourself to other organisations such as Qantas, iiNet or the Commonwealth Bank. One of our clients, who used Net Promoter to improve IT customer satisfaction by 25 points in just 6 months, had the rallying cry of “Let’s not be a Toyota, let’s be a BMW”, referring to the relative Net Promoter Scores of those brands. 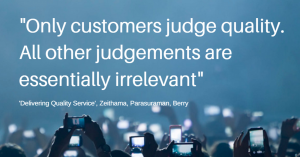 If you’re not surveying your customers to understand how they perceive your performance, you should be. And if you’re not using Net Promoter to do it, you should be. 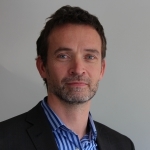 Dave O’Reardon is leading a workshop on ‘Customer-driven service improvement with Net Promoter’ at Service Management 2015.